A Stones Throw From East Beach And Dog Friendly. This is a Carroll B. Ishee house - designed by the noted Gulf Coast architect. It is a Japanese style cottage with decks on three sides. It is located in a cul de sac in a secluded part of Ocean Springs. It has an open floor plan, with large bay windows on the wooded side of the house. Many people enjoy the wildlife that is visible from the house. Birds, rabbits, raccoon, and of course turtles make there appearance on a daily basis. There is a bald eagle nest within one thousand yards of the house. Numerous seabirds and coastal birds are in evidence on any normal day from the bayous, beach, and estuaries nearby. Dolphin sightings from the beach are reasonably common. And ceiling fans in most rooms. The house is on a cul de sac, and there is more gated parking space in private fenced yard. Internet included with Wifi and cable television. Seats 6 inside, 4 on the deck, and 4 on the grill porch. Televisions in living room, bedroom, and outside on deck. Multiple large gated private decks with shade, grill, fire pit, table and chairs, and outdoor tv. Municipal tennis courts are two blocks along residential roads. We are sorry, but his house was built with steps and we cannot accommodate wheelchairs. We did a girls trip, & we enjoyed it.. The house was nice and cozy.. The house was off to it's self, we didn't have to worry about anyone bothering us. & the owner was very nice..
Hidden gem in the trees! 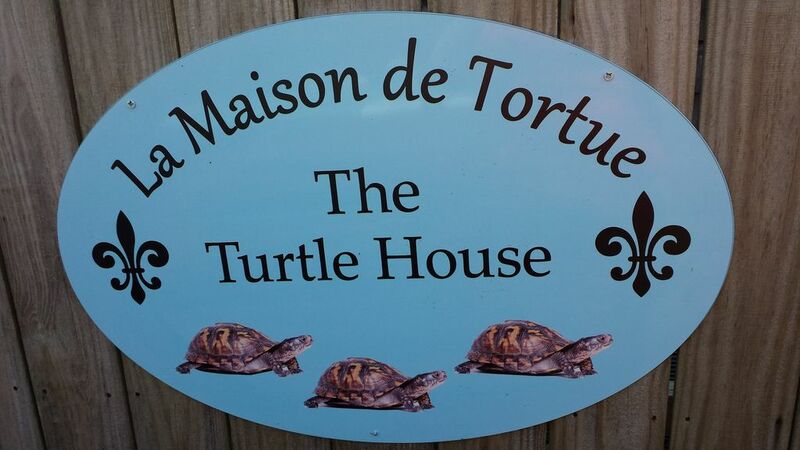 Our family of 4 had a lovely time at Turtle House. Beautiful layout and scenic deck area. Windows looking out were fascinating during storm. So convenient to town but still away from it all, would be a great base for exploring the greater gulf coast area, its an excellent value for the price paid. Our dog loved his freedom to go from one part of the fenced yard to another with the decks included! He was most curious about the armadillo that he and I saw from the deck!!! Bunk beds were the only drawback, the mattresses were very thin and our teenagers could feel the boards through them (perhaps add another mattress). Good supply of brochures available showing what's in the area. So convenient having wifi and washer/dryer, just like being home! Good kitchen setup also!! Thank you for the hospitality, loved Ocean Springs!! The Turtle House was even better then I imagined it could be. The area was was so calm. Definitely want to come back. What a perfect abode and location - open, airy, and comfortable! Close to everything! My girls and pup had a wonderful experience and plan on coming back! Thank you again! Everything went smoothly, the place was very clean, it was supplied for all our needs. My 8 year old daughter especially loved the house and finding all the turtles. Ocean Springs is such a charming beach town. We had a great stay. House was comfortable except for the bunk beds. They are very uncomfortable. Too thin mattresses. Can feel the wooden slats through them and your body falls through the space between the stats. Wouldn’t even want children to have to sleep on them. House and kitchen were well equipped. Owner was very accomodating. The Turtle House on Gum Street is a unique property designed by Carroll B. Ishee. The house is hidden away in old Ocean Springs. It is built of glass and wood to bring nature inside. We particularly like to have people with dogs. The house has a series of terraces and a yard that dogs enjoy which are all separately enclosed for their safety. The house has two bedrooms and two baths. It sleeps six - this includes two bunkbeds and one queen size bed. The baths have Jacuzzi tubs that are wonderful. There is plenty of safe parking. Car show enthusiasts will note that there is roll in access to the gated yard and room for several cars. You will find it quiet and joyous. There is a $50 cleaning fee for each rental. Rates subject to change until reservation is confirmed.